Can You Spot the Typography Errors? Today I was behind this lovely landscaping truck at a stoplight, giving me ample time to observe (and photograph) the typography of its bumper graphics. Unfortunately, a lot of the type could use some tweaks. Can you spot the “no-no”s? Can you spot the typography flaws in this design? Generic font choice. 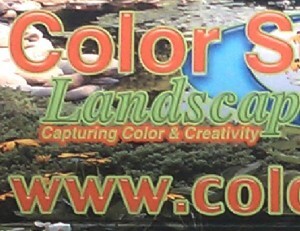 The fonts used for this company’s logo lack imagination. It appears that the designer used a combination of Helvetica and Times, two of the most common fonts available. Selecting such common fonts fails to make the logo memorable and speaks to too large of an audience. A more specialized, lesser-used type face would be more likely to stand out against competitors and set a tone for the company’s brand personality. Type over a photo.Though it’s quite common to see type set against a photo, in execution it can be quite difficult. Proper placement of type over a photo. The logo was inverted for better contrast and placed in a region of the photo that was darker with less visual clutter. The designer here has chosen to lay the type over a busy part of the photograph, making it difficult to to see the contrast of the type against the background. A better option would have been to select a photo that had a large portion of “type space” in it instead. Examples of type space might include a region of blue sky, a grassy lawn, or a dark area, such as the rocks in the foreground of the photo they selected. If no other photo option were available, it would have been best to create a photo-free dedicated area of the layout for type, or to apply a subtle effect to part of the photo to blur or dull a region of the photo. A close-up of the text shows outlined type, 3-dimensional shadows and highlights applied, and an orange glow effect. contrast between the type and the photo background. In doing so, however, the type has become more difficult to read! The green outline on the orange type makes the type look blurred from a short distance (as does the dark orange border around the tagline!). Plus, the designer here has applied a three-dimensional effect to the letters that neither enhances readability nor reinforces the brand (are we to surmise from the dimensional letters that they use a lot of rocks in their designs?) When it comes to effects, I’m of the camp that less is more; a designer should have a good reason—that is, a good branding reason (the effect reinforces an element of the brand’s unique products or services)—for applying an effect to type. My intent for sharing this example is only to instruct. It’s often by redesigning others’ layouts that we learn more effective solutions than the ones presented. Is this a bad designer who did this? I doubt it. With so many do-it-yourself print sites out there now, and plenty of people who don’t want to spend the time or money on good design, this type of layout is an inevitable result. Just remember, if you don’t invest in your brand, it will be more difficult to get clients to invest in you! This entry was posted on Monday, July 2nd, 2012 at 1:50 pm and is filed under Design Tricks and Tips. You can follow any responses to this entry through the RSS 2.0 feed. You can leave a response, or trackback from your own site.